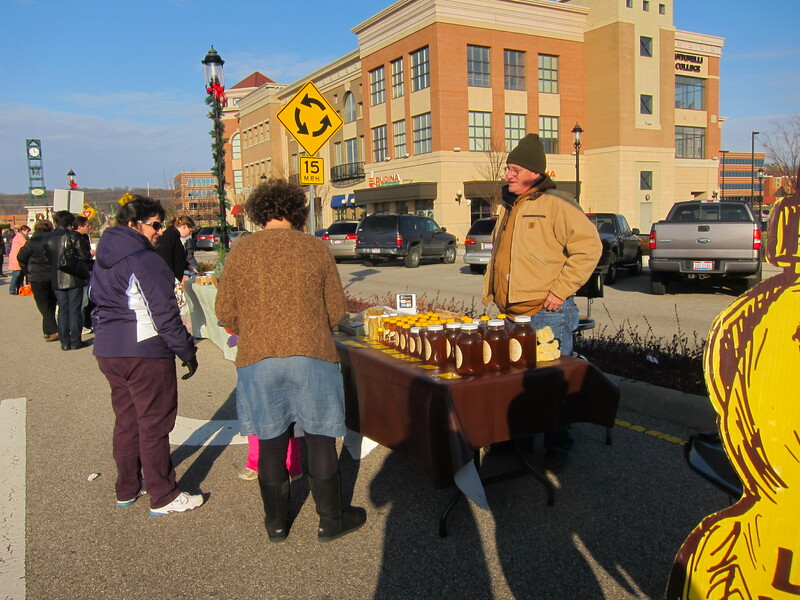 December is upon us and boy was it chilly at the West Chester Farmers’ Market. The customers that braved the weather were met with wonderful options for those last minute Christmas gifts, as well as stocking up for winter, should snow ever touch ground this year. Nancy of Wooden Shoe Baked Goods husband came this Saturday and was selling a very tasty bloody mary’s mix, you should defintely try it the next time he’s there! Many others included Dale at Morning Sun Farm, the Jam and Jelly Lady, Millbranch Farm, Twin Creek Farm Seasonings, Bill of Intarsia (who makes all the beautiful wood inlay works), and a many others. A big thanks to all of you readers and/or honey advocates. This past year hasn’t been too bad, all things considered. The bees continue to struggle while the beekeeping commununity tries to figure out a solution to the Colony Collapse Disorder (CCD). Don’t forget we have a farmers’ market once a month until May. So come out and say “HI!” anytime between 2-3:30pm on Saturday; February 11, March 10, April 7, and April 28, 2012.